You know those surveys you see every now and again about what habits drivers find annoying? They're all wrong because they are based on a non-petrolhead point of view from a non-petrolhead population sample. In fact the survey respondents tend to be the cause of said irritations. 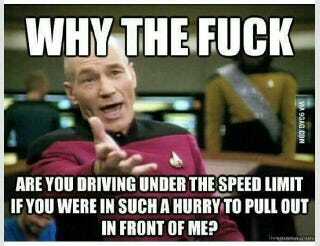 Here are my top ten ways that other drivers annoy me on the road. What are yours? Traffic lights change to green and they take ages to pull away. Go! For fecks sake. We haven't got all day. People who slavishly follow lane discipline on motorways to the nearest millimetre. They duck in and out - lane 2, 3, 2, 1, 2, 3 exactly mirroring other drivers movements. Chill the feck out! Take it smooth. People who don't follow lane discipline on roundabouts. I'm coming through on the inside.....WOAH what the feck are you doing wandering about in front of me! Rubberneckers. I know there's a fecking accident on the other side of the motorway and I've got to sit behind you whilst you have a good look to see if there's any blood or guts visible! People who drive buses and people who are in buses. You are slow, you stop at every bus stop (except for the ones with people who are waiting to catch the bus), you cannot be overtaken, you hurt my fecking eyes with your dirty fecking particulates. People who do 40mph in 60mph zones and in 30mph zones. I'm stuck behind you for miles and then you drive past my kids school at fecking 40mph! Random brakers. We're driving smoothly, all is good. WOAH! Why are you fecking braking, there's nothing around you! Stop braking all the time. People who round corners on the wrong side of the road. I'm approaching a corner on a country lane and what the feck get on your own side of the road you moron! People who suddenly slow down as they exit level crossings. WOAH! What are you playing at! I'm stuck on a fecking level crossing. Put your foot down! People who block entire petrol stations whilst they queue for the pump that dispenses on the side of the car their fuel filler is on. It stretches right across you silly feckwit! Those are mine. What are yours? I'm looking forward to hearing these on twitter and in the comments section.